Congratulations 2017-2018 DVEF Teachers of the Year!! Thank you to our sponsors! : Discover Financial, Deer Valley Credit Union, McCarthy Building Companies, DLR Group, Valley Schools, Gary & Diana Feldman, DKG, AZ Broadway Threatre, smartschoolsplus, Grads Photography, and GET AWAY... TODAY. THANK YOU TO OUR TEACHERS AND OUR SPONSORS!! Dena Cunningham, Vice President, Finance and Ethics Officer at ACSS. She is also DVEF's new treasurer. Kathy Northrop, Director of Pediatric Services and Mendy’s Place at John C. Lincoln Hospital – Deer Valley. 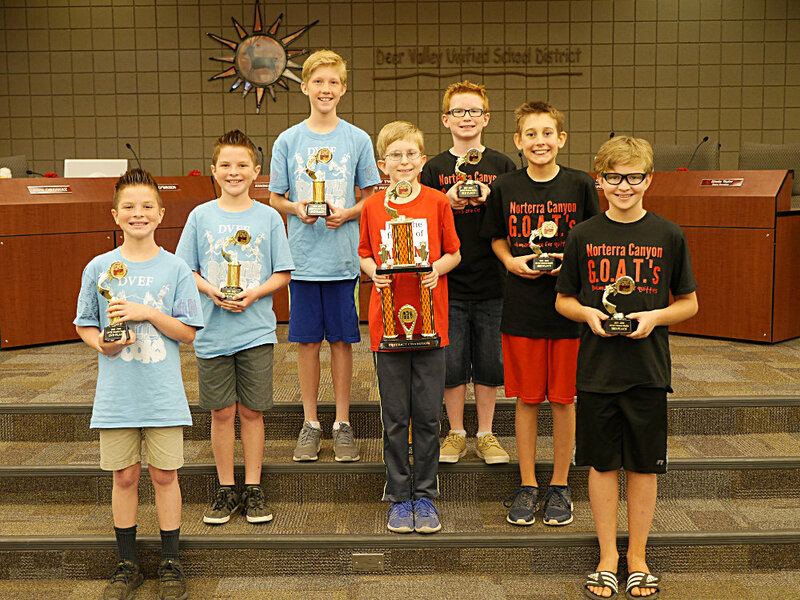 DVEF’s Battle of the Books is a reading program funded by the Deer Valley Education Foundation for 5th and 6th grade students who team themselves in groups of up to three. Team members were assigned 4 pre-selected books for 3 competitions during the year, which means students read and answered questions from a total of 12 books outside their regular school work and all the household chores. The highest scoring team from each school is here today representing their school and their classmates. 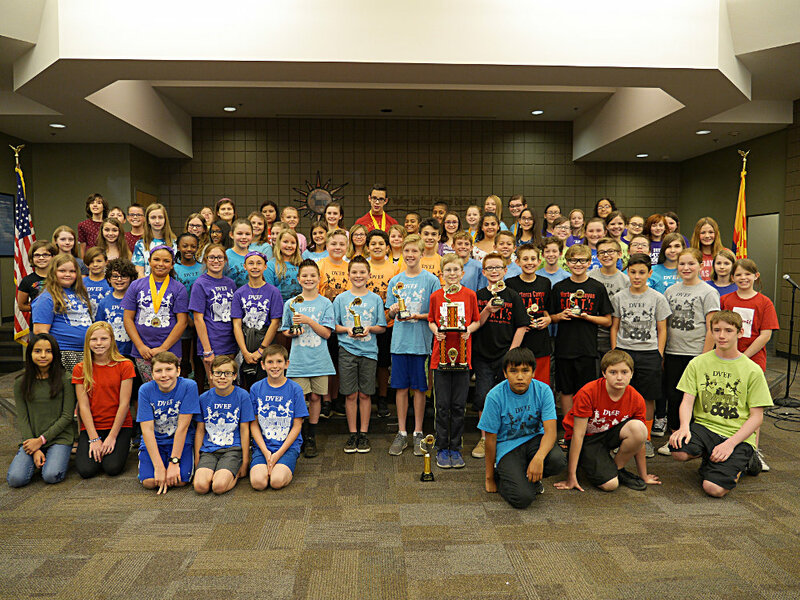 This is the 5th year for DVEF Battle of the Books. In Year one, we had 8 schools participating with about 160 students. Now, in year 5, we have 27 schools participating with a total of 239 teams with over 700 students!! So you can see this is a very successful program that our kids LOVE! Thanks to this program, and the participation of these students, the Deer Valley Education Foundation has donated a total of about 24,000 books to our school libraries!! I’d also like to thank the media center specialists and teachers at each school who make this possible at your child’s school. 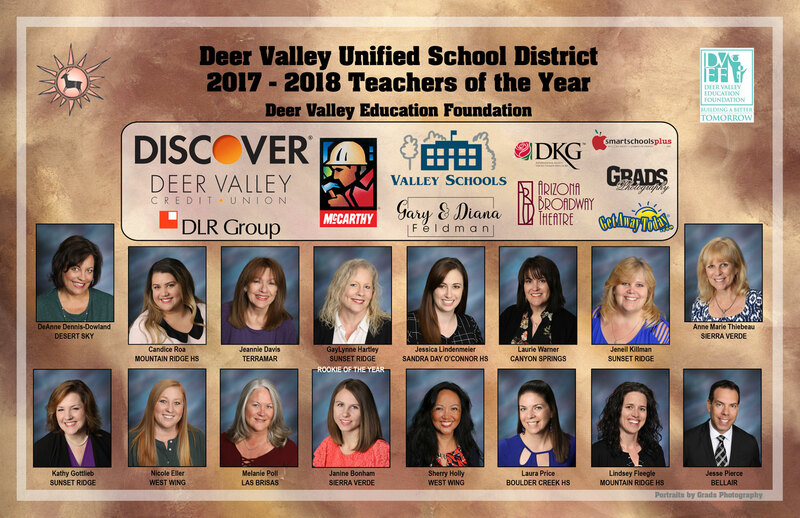 As many of you already know, The Deer Valley Education Foundation, a 501 (C) (3) nonprofit organization, funds programs that enrich the educational environment of our students and teachers in the Deer Valley Unified School District through teacher grants, student scholarships, aid to students, etc. If you are already donate to the Foundation through payroll deductions, I want to thank you. Your support is very much appreciated! Over the past 10 years, DVEF has contributed almost $1 million directly to DVUSD schools, teachers, students, and programs! This could not happen without your help! Half of your membership can be designated to your school or program of your choice. 100% of your contribution stays within the Deer Valley Unified School District. All program funds support projects that enrich the education of our students. Your support will help fund the increasing needs of a fast growing school district that teaches over 36,500 students. Your contribution can easily be made through a minimum payroll deduction each pay period. Your membership is tax deductible. Your gift will not only help support the school or program of your choice, but also supports programs such as individual classroom projects (reading, science, math, technology, etc. ), recognizes outstanding teachers, nurses, and administrators, provides scholarships and teacher grants; and also helps students in need of some very basic items. We want to do so much more! The funding for the Foundation is obtained through grants, corporate gifts, and special events such as the annual golf outing, but most noteworthy and meaningful are those contributions from you, our own DVUSD faculty and staff. Donation form . If you would like to contribute and help support our students, teachers, and schools, please complete the form and return it to DVEF in the district office, attention Marie Brennan. Thanks in advance for contributing in any way you can. PHOENIX, Ariz. – May 3, 2011 – The Deer Valley Education Foundation (DVEF) donated $30,000 to the Deer Valley Unified School District to start a Science Resource Center (SRC) to be located in the Materials District Center. It is the largest grant DVEF has awarded the district. The funding will be used to pay for the support of shelves and other necessary supplies to stock Full Option Science System (FOSS) kits, a research-based science curriculum for grades K-6 developed at the Lawrence Hall of Science, University of California at Berkeley. DVEF’s proudest accomplishment to date is voting to fund $30,000 for the DVEF Science Center. The DVEF Science Center will enable a centralized location to restock and organize the FOSS (Full Option Science System) Science kits which are distributed to teachers. The FOSS system is designed so students will experience hands-on science leading to greater and deeper understanding of science concepts as they apply their inquiry and data collection skills. Without DVEF's Science Center,the FOSS Program is hard for teachers to use. This center removes the obstacles for teachers and makes it easy for them to teach these science lessons. If you have any questions or if you are interested in sponsoring a specific FOSS kit, please be sure to caotact Marie Brennan at 623-445-5012. Thanks to BHHS Legacy Foundation, the Deer Valley Education Foundation is able to offer scholarships to aid financially eligible DVUSD junior and senior high school students who have an interest in any type of medical career. This scholarship will pay for dual enrollment classes and/or cover the costs of AP exams. are part of the experiences we add to the District. the needs of every child in every school. DVUSD school of your choice. Please consider donating to the Deer Valley Education Foundation through your United Way payroll deductions. All you need to do is write in our agency code (#836) and our agency name is Deer Valley Education Foundation (DVEF). This is all the info you need to direct your funds to The Deer Valley Education Foundation. If you have any questions please be sure to contact Marie Brennan at 623-445-5012, and thanks again so much! !